Kealoha’s Taste of the Islands, which was resurrected in the old Honolulu Harry’s spot in Chino less than two years ago, has sailed off into the Hawaiian sunset. 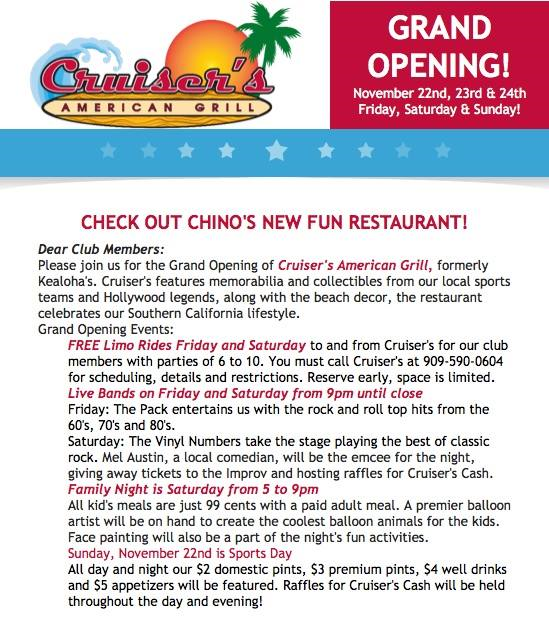 In its place is Cruiser’s American Grill, featuring burgers, sandwiches, salads and other mainland specialties. 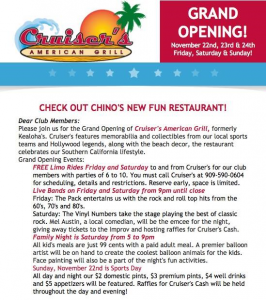 Cruiser’s is celebrating its grand opening today (November 22) through Sunday (November 24). Click the photo above to see some of the grand opening specials. Cruiser’s will be open 11 a.m. to 10 p.m. Mondays through Thursdays, from 11 a.m. on Fridays and Saturdays and from 9 a.m. to 9 p.m. on Sundays. Cruiser’s American Grill is at 12206 Central Ave. This entry was posted in Chino and tagged closings, openings by John Plessel. Bookmark the permalink.